Tree following Werner (1973) and Bridge et al. (1995). The exclusively aquatic phylum Cnidaria is represented by polyps such as sea anemones and corals, and by medusae such as jellyfish. A polypoid or a medusoid cnidarian is a radially or biradially symmetrical, uncephalized animal with a single body opening, the mouth. The mouth is surrounded by tentacles studded with microscopic stinging capsules known as nematocysts that are the agents of offense and defense. The possession of intrinsic nematocysts is the defining characteristic of the phylum (Hessinger and Lenhoff 1988); nematocysts are the most diverse and widespread of three types of cnidae (cnidos = thread) -- hence the preferred name of the phylum. Cnidarians are diploblastic -- that is, the body and tentacles consist of two cell layers, the endoderm (sometimes referred to as the gastrodermis) and the ectoderm (the epidermis). Between the two cell layers is the mesoglea, which ranges from little more than a glue to bind the layers (for example, in Hydra) to the vast bulk of the animal (for example, in jellyfish of Class Scyphozoa). The body encompasses a single sac-like body space, the coelenteron (koilos = cavity; enteron = intestine), which communicates with the surrounding medium through the mouth. The less preferred name of the phylum, Coelenterata, is based on this attribute. The coelenteron (also termed the gastrovascular cavity) serves for gas exchange and digestion. All cnidarians are carnivorous, with cnidae and tentacles active in prey capture. Because polyps are typically sessile, and only some medusae possess sensory structures (the most sophisticated occur in the Cubozoa; Pearse and Pearse 1978), cnidarians are generally believed to be passive predators, feeding on prey items that blunder into their tentacles. Some cnidarians can absorb dissolved organic matter directly from seawater (e.g. Schlichter 1975), but it is not known how widespread this ability is. Living within the tissues of anthozoans of many species and hydrozoans and scyphozoans of a small number of species are unicellular algae from which the animals derive reduced carbon (Shick 1991). Dinoflagellate symbionts, termed zooxanthellae, are by far the most common algal symbionts; they are exclusively marine. Green algal symbionts, termed zoochlorellae, occur in both marine and freshwater cnidarians. The text-book depiction of the typical cnidarian life cycle is an alternation between a medusa and a polyp (termed metagenesis), the former the sexually reproductive stage and the latter the asexual stage. In fact, an attribute of the entire class Anthozoa is the absence of a medusa. At least some individuals of all anthozoan species form gametes; those of some species may reproduce vegetatively as well. The other three classes -- Cubozoa, Hydrozoa, and Scyphozoa -- are often grouped as the "Medusozoa" because the medusa phase is present in them all. Indeed, the medusa dominates the life cycle of members of the classes Cubozoa and Scyphozoa (Cubozoa was formerly considered an order of Scyphozoa, and some specialists still consider it as such). Life cycles of the Hydrozoa are the most diverse in the phylum: although the polyp is the more conspicuous and persistent stage in most taxa, some lack the medusa phase, whereas others lack the polyp phase. Hydra, which is used in many textbooks to illustrate the phylum, is utterly atypical: a hydrozoan, it lacks a medusa, it has aggregations of gametogenic tissue that function as gonads, and it is among only a handful of freshwater cnidarian species. The cnidarian larva is the planula, a pear-shaped, entirely ciliated animal. In the "typical" cnidarian life cycle, male and female medusae spawn freely into the sea, where fertilization occurs and a planula develops. At metamorphosis, the planula settles on and attaches to the substratum, where it metamorphoses into a polyp. The primary polyp produces additional polyps asexually, by budding, stolonic outgrowth, or some other process, to form a clone or a colony. At the appropriate time, determined perhaps by size of the colony or environmental conditions, rather than or in addition to polyps, medusae are produced asexually (in Cubozoa, each polyp metamorphoses into a medusa). They are released to take up a pelagic existence and the cycle begins anew. Idealized lifecycle of the Cnidaria. The cnida, or nematocyst, which is the sine qua non of the phylum, is secreted by the Golgi apparatus of a cell termed a cnidoblast (Watson 1988). A cnida therefore is technically not an organelle, but, rather, the most complex secretory product known. Upon receiving the appropriate physical and/or chemical stimulus, a cnida fires, everting a tubule many times the length of the capsule. The tubule may deliver a toxin, may stick to a prey item, or may entangle an object, depending on the type of cnida. A cnida can fire but once. 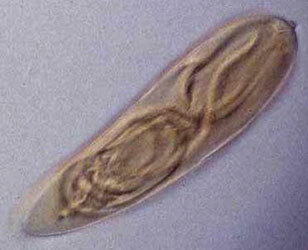 There are three major types of cnidae: nematocysts, spirocysts, and ptychocysts. Nematocysts occur in all classes of Cnidaria, but some of the 30-plus varieties of nematocysts are restricted to members of certain classes (Fautin and Mariscal 1991). 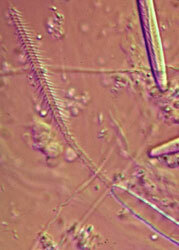 Spirocysts are found only in Anthozoa; they are adhesive in nature. Ptychocysts are the most taxonomically restricted in distribution, occurring only in the anthozoan order Ceriantharia; their function is to entangle bits of mud among their robust tubules to form the feltwork that constitutes the tube of these burrowing animals. Left: Fired "basitrich" (basitrichous isorhiza) from a sea anemone. The now empty capsule is in the lower right of the photo; the spiny basal part of the fired tubule extends to the upper left; beyond the frame of the photo is the non-spiny, distal part of the tubule, which is many times longer than the capsule. Middle: "Holotrich" (holotrichous isorhiza) from a corallimorpharian. Right: Unfired "basitrichs" (basitrichous isorhizas) from a sea anemone. The longitudinal line inside each capsule is the spiny basal part of the unfired tubule. Two body forms are characteristic of cnidarians -- the polyp and the medusa. With a few exceptions, a columnar polyp is sedentary, being attached to or burrowed into the substratum by the end opposite the mouth. Thus its tentacles are typically considered to point upward and outward. 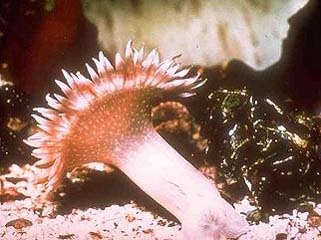 Polyps of some species propagate vegetatively, forming colonies (if the progeny remain attached to one another) or clones (if the progeny separate). Polymorphism occurs in colonies of some species of hydrozoans and anthozoans, the polyps being specialized for functions such as feeding, defense, and sexual reproduction. Polyps of some taxa form a skeleton within or external to their tissues; some skeletons are mineralic (of calcium carbonate), others are organic (of chitin or another carbohydrate), and some are both. The spheroidal or discoidal medusae are solitary, and those of most species are pelagic. Although typically depicted as living with mouth and tentacles pointing down, medusae assume all orientations in the water. Medusae of few species possess the ability to propagate vegetatively. The common name of medusae, jellyfish, alludes to the massive amount of mesoglea that contributes to their buoyancy. All cnidarians have hydrostatic skeletons, regardless of whether they also have mineralic and/or organic exoskeletons or endoskeletons. The muscles of the body wall operate against the fluid in the coelenteron to extend individual polyps and to effect the swimming of medusae, for example. 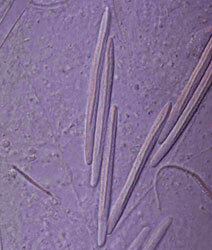 The hollow tentacles of anthozoans are extended through hydrostatic action as well. Cnidaria is thought to have one of the longest fossil histories of metazoan phlya with representatives in the Ediacaran fauna of the late Precambrian (Scrutton 1979). These earliest fossils are both medusoid and polypoid, and thought to represent all cnidarian classes (Scrutton 1979). The four extant cnidarian classes are identifiable as early as the Ordovician (Robson 1985), but evolutionary relationships among them have been the subject of much debate (e.g. Brooks 1886, Hyman 1940, Jagersten 1955, Hand 1959, Pantin 1960, Werner 1973, Petersen 1979, Barnes 1987, Ax 1989). Anthozoa is alternatively considered the most basal or the most derived group. The former hypothesis posits that the polyp is the original body form, with the medusa (and metagenesis) being derived (Fig. 1A). The latter perspective is that, in the "typical" life cycle, the medusa is gametogenic, and so constitutes the definitive, or adult, stage, with the polyp being a persistent larva. Thus, it is reasoned, the polyp evolved secondarily, and loss of the original body form, the medusa, places Anthozoa as the most derived taxon (Fig. 1B). A comprehensive morphological cladistic analysis by Schuchert (1993) supports the basal position of Anthozoa with the Scyphozoa and Cubozoa being more closely related to each other than to Hydrozoa. Morphological, mtDNA, and 18S rDNA data separately and together also support the basal position of Anthozoa but do not resolve the relationships among Scyphozoa, Cubozoa and Hydrozoa (Bridge et al. 1995). The phylogenetic tree at the beginning of this page is that of Bridge et al. (1995). Neither of these treatments attempts to include the extinct class Conulata, which has been considered by most paleontologists to be related to the Scyphozoa. Their diploblastic structure and their single body opening and cavity had been thought to ally cnidarians with ctenophores. Indeed, until relatively recently the phylum Coelenterata was considered to include animals now placed in Cnidaria and Ctenophora. However, ctenophores lack a metagenetic life cycle and cnidae. Cnidae have been found in one ctenophore, but it is now known that the ctenophore acquires those cnidae from the hydromedusae upon which it preys (Mills and Miller 1984). Thus, it is generally agreed that the similarity in body form between pelagic ctenophores and pelagic cnidarians is convergent; benthic ctenophores do not resemble cnidarians at all. Cnidaria, therefore, is a well circumscribed taxon; it is considered by many to be a sister group of all metazoans other than sponges. Ax, P. 1989. Basic phylogenetic systematization of Metazoa. Pp. 453-470 in K. B. B. Fernholm and H. Jornvall (eds.). The Hierarchy of Life. Elsevier, Amsterdam. Bridge, D., C. W. Cunningham, R. DeSalle, and L. W. Buss. 1995. Class-level relationships in the phylum Cnidaria: Molecular and morphological evidence. Molec. Biol. Evol. 12:679-689. Bridge, D., C. W. Cunningham, B. Schierwater, R. DeSalle, and L. W.
Buss. 1992. Class-level relationships in the phylum Cnidaria: Evidence from mitochondrial genome structure. Proc. Nat. Acad. Sci. USA 89:8750-8753. Brusca, C. B. and G. J. Brusca. 1990. Invertebrates. Sinauer Associates, Sunderland MA. Dunn, D. F. 1982. Cnidaria. Pp. 669-705 in S. P. Parker (ed.) Synopsis and Classification of Living organisms. McGraw-Hill, New York. Fautin, D. G. and R. N. Mariscal. 1991. Cnidaria: Anthozoa. Pp. 267-358 in F. W. Harrison and J. A. Westfall (eds.) Microscopic Anatomy of Invertebrates, volume 2: Placozoa, Porifera, Cnidaria, and Ctenophora. Wiley-Liss, New York and other cities. Hand, C. 1959. On the origin and phylogeny of the Coelenterata. Syst. Zool. 8:192-202. Hessinger, D. A. and H. M. Lenhoff. 1988. Preface. Pp. xi-xii in D. A. Hessinger and H. M. Lenhoff (eds.) The Biology of Nematocysts. Academic Press, San Diego and other cities. Hill, D. and J. W. Wells. 1956. Cnidaria -- general features. Pp. F5-F9 in R. C. Moore (ed.) Treatise on Invertebrate Paleontology: Part F, Coelenterata. Geological Society of America and University of Kansas Press. Hyman, L. H. 1940. The Invertebrates: Protozoa through Ctenophora. McGraw-Hill, New York. 726 pp. Hyman, L. H. 1956. Morphology of living coelenterates. Pp. F10-F20 in R. C. Moore (ed.) Treatise on Invertebrate Paleontology: Part F, Coelenterata. Geological Society of America and University of Kansas Press. Jagersten, G. 1955. On the early phylogeny of the Metazoa: the bilaterogastraea theory. Zool. Bidr. Uppsala 30: 321-354. Mackie, G. O. (ed.). 1976. Coelenterate Ecology and Behavior (Selected papers from the Third International Symposium on Coelenterate Biology, held at the University of Victoria, Victoria, British Columbia, May 10-13, 1976). Plenum Press, New York and London. 744 pp. Meglitsch, P. A. and F. R. Schram. 1991. Invertebrate Zoology (3rd ed.). Oxford University Press, New York and Oxford. 623 pp. Mills, C. E. and R. L. Miller. 1984. Ingestion of a medusa (Aegina citrea) by the nematocyst-containing ctenophore Haeckelia rubra (formerly Euchlora rubra): phylogenetic implications. Mar. Biol. 78:215-221. Muscatine, L. and H. M. Lenhoff (eds.). 1974. Coelenterate Biology: Reviews and New Perspectives. Academic Press, New York and other cities. 501 pp. Nielsen, C. 1995. Animal Evolution: Interrelationships of the Living Phyla. Oxford University Press, Oxford. 467 pp. Pantin, C. 1960. Diploblastic animals. Proc. Linn. Soc.171:1-14. Pearse, J. S. and V. B. Pearse. 1978. Vision in cubomedusan jellyfishes. Science 199: 458. Pearse, V., J. Pearse, M. Buchsbaum, and R. Buchsbaum. 1986. Living Invertebrates. Blackwell Scientific Publications, Palo Alto, CA. 848 pp. Petersen, K. W. 1979. Development of coloniality in Hydrozoa. Pp. 105-139 in G. Larwood and B. R. Rosen (eds.). Biology and Systematics of Colonial Organisms. Academic Press, New York. Rees, W. J. (ed.). 1966. The Cnidaria and their Evolution (The Proceedings of a Symposium held at The Zoological Society of London on 3 and 4 March 1965). Zoological Society of London and Academic Press, London and other cities. 449 pp. Robson, E. A. 1985. Speculations on coelenterates. Pp. 60-77 in S. Conway Morris, J. D. George, R. Gibson, and H. M. Platt (eds). The Origins and Relationships of Lower Invertebrates. Clarendon Press, Oxford. Ruppert, E. E. and R. D. Barnes. 1994. Invertebrate Zoology (6th ed.). Harcourt Brace College Publishers, Fort Worth. 1056 pp. Schlichter, D. 1975. The importance of dissolved organic compounds in sea water for the nutrition of Anemonia sulcata Pennant (Coelenterata). Pp. 395-405 in H. Barnes (ed.). Proceedings of the 9th European Marine Biolological Symposium. Schuchert, P. 1993. Phylogenetic analysis of the Cnidaria. Z. Zool. Syst. Evolut.-forsch. 31:161-173. Scrutton, C. T. 1979. Early Fossil Cnidarians. Pp. 161-207 in M. R. House (ed.) The Origin of Major Invertebrate Groups. Academic Press, London. Shick, J. M. 1991. A Functional Biology of Sea Anemones. Chapman and Hall, London and other cities. 395 pp. Tardent, P. and R. Tardent (eds.). 1980. Developmental and Cellular Biology of Coelenterates (Proceedings of the 4th International Coelenterate Conference held in Interlaken, Switzerland, 4-8 September, 1979). Elsevier/North-Holland Biomedical Press, Amsterdam and other cities. 499 pp. Tokioka, T. and S. Nishimura (eds). 1973. Proceedings of the Second International Symposium on Cnidaria. Publ. Seto Mar. Biol. Lab. 20:1-793. Watson, G. M. 1988. Ultrastructure and cytochemistry of developing nematocysts. Pp. 143-164 in D. A. Hessinger and H. M. Lenhoff (eds.) The Biology of Nematocysts. Academic Press, San Diego and other cities. Werner, B. 1973. New investigations on systematics and evolution of the class Scyphozoa and the phylum Cnidaria. Publ. Seto Mar. Biol. Lab. (Proceedings of the Second International Symposium on Cnidaria) 20:35-61. Williams, R. B., P. F. S. Cornelius, R. G. Hughes, and E. A. Robson (eds.). 1991. Coelenterate Biology: Recent Research on Cnidaria and Ctenophora (Proceedings of the Fifth International Conference on Coelenterate Biology, 1989). Kluwer Academic Publishers, Dordrecht and other cities. 742 pp. Cnidaria Home Page. University of California, Irvine. From D. G. Fautin and G. R. Allen. 1992. Field Guide to Anemonefishes and their Host Sea Anemones. Western Australia Museum. A direct-developing holoplanktonic hydromedusa (Hydrozoa) that has no polyp. The gonads are visible through the transparent bell. Creation of this page was supported by NSF grant DEB9521891 (PEET: Partnerships for Enhancing Expertise in Taxonomy) to DGF. Technical assistance was rendered by Chad Campbell.